Have you ever had creamy white chicken chili? If not, you’ve got to give this recipe a try. It’ll surely satisfy your Fall chili cravings. There’s nothing like a pleasing, comfort meal and creamy white chicken chili fits right in. 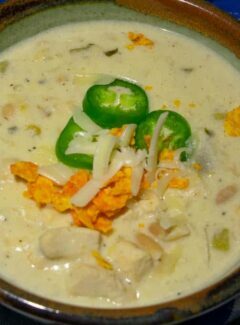 I’ve made white chicken chili before, using my daughter Katy’s recipe. This recipe is adapted from a firefighter in Upsala, Minnesota who is a finalist in a national firefighters chili cook-off contest. Garrett Doucette is one of 5 finalists in the America’s Best Firehouse Chili Contest, sponsored by Hormel. Since it is starting to cool down in Minnesota, I knew I had to give his recipe a try. Garrett is a turkey farmer, so obviously, he uses turkey in his recipe. Fresh chicken is so much easier to find in stores, (especially when it’s not Thanksgiving), so I used boneless, skinless chicken breasts. The breasts were cut into 1/2 inch cubes. Leftover cooked chicken would work too. Just shred the chicken into bite-sized pieces. 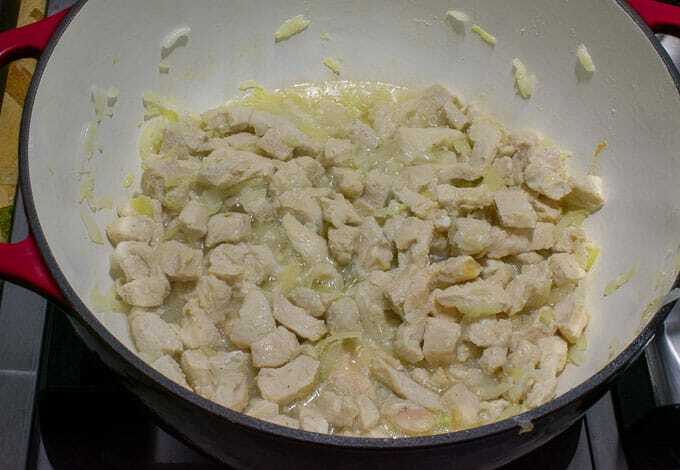 Cook the chicken and onion together until the chicken is cooked through which takes 12 to 15 minutes. You can tell when the chicken is done when there’s no pink spots on the meat and clear juices are coming out. Next, all the ingredients except the cream and sour cream are added and simmered for about 30 minutes. 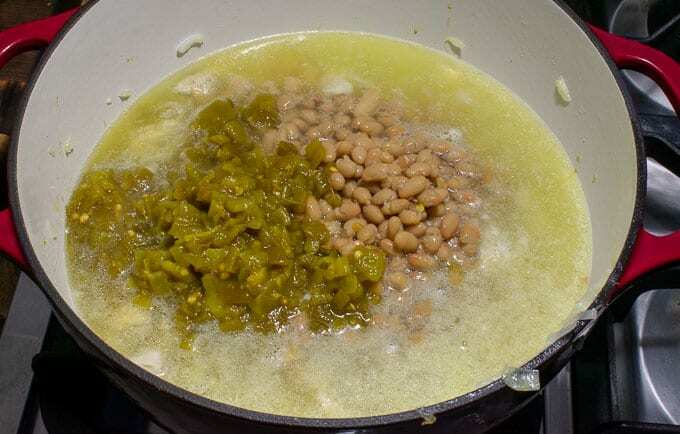 3 cans of white beans are used, but I mashed the beans of one can as a thickener. If your chili seems a little too thick, add some more chicken broth. After 30 minutes, remove the pot from the stove and stir in the sour cream to combine, then add the heavy cream. 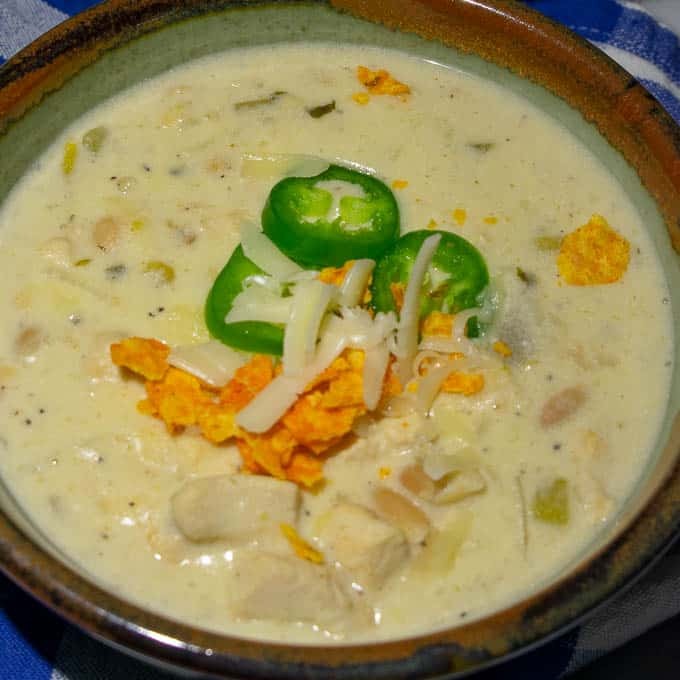 Serve the creamy white chicken chili hot and garnish with shredded cheese, tortilla strips, and maybe some sliced jalapeno pepper. A few splashes of hot sauce are good in this too. I used Gringo Bandito hot sauce…my new favorite. Delicious, protein packed white chicken chili, perfect for Fall weather. Next, add all other ingredients except the cream and sour cream, bring to a boil, then reduce heat to simmer, 30 minutes. Recipe adapted from Garrett Doucette, Upsala, Minnesota. We had this with hot-out-of-the-oven cornbread and it really was the perfect fall supper. We love white chicken chile. This is perfect for the start of chili season in Minnesota! This is a different recipe than I’ve used before Al, but it is very good. You could kick it up a bit with 1/8 to 1/4 teaspoon cayenne pepper. Hope you like it. Very good as left-overs.